Mass action requires a mass of people! Come defend the buffalo by joining us on the front lines. We have had over 2400 volunteers from across the country and around the world join us on the frontlines to help save the Yellowstone buffalo. The Buffalo Field Campaign is the only group living and working in the Yellowstone Ecosystem full time. We are on patrol all day, everyday, when buffalo are out of the park and in danger. BFC patrols defend the buffalo on their critical, native Montana habitat and document every move made against them. Please consider becoming a BFC volunteer. The future of America's last free-roaming herd depends on you! The Buffalo Field Campaign has seasonal openings for field volunteers. We have opportunities for every season, but are in great need of folks during the Winter when the buffalo migrate to lower elevation in search of forage, and especially the Spring months when the mothers venture to their traditional calving grounds outside the Park boundaries. Any buffalo within Montana's borders is in danger of being shot on sight, hazed, or captured and shipped to the slaughterhouse. All volunteers are provided room, board, gear, and training. We respect vegan and vegetarian diets. We are located in a warm log cabin by beautiful Hebgen Lake, just a few miles outside of West Yellowstone, Montana. Please contact us before you make your plans to volunteer. (Directions to Camp- West Yellowstone) When you arrive, you will be greeted by our volunteer coordinator who will help get you settled in. There will be a orientation and training period to familiarize you with camp and allow us to assess your abilities and where your skills can be used the most effectively to help save the buffalo. There are many jobs to choose from... patrols, cabin projects, educational projects, we have a long list. Patrols are either done from cars or on skis or showshoes. If you do not know how to ski or snowshoe, do not fret, we will teach you. If you are flying or taking a bus into Bozeman and will need a ride to camp it is best to arrive on a Wednesday when we do our weekly town runs. Please read our Volunteer Agreement. Buffalo Field Campaign is dedicated to protecting Yellowstone’s bison 365 days a year. Each season brings its own unique weather, beauty and needs for BFC's base of operations near Hebgen Lake just outside West Yellowstone, Montana. BFC is made possible by people like you. If you want to help create a legacy where the last wild buffalo roam free, please consider volunteering your time and energy with us. FALL: Fall sees the end of the rut - the buffalo mating season! It is also when we prepare camp for the cold winter months just around the corner. Join us for Woodcut Weekend during the first weekend of October, when volunteers turn out to gather and cut a winter’s supply of firewood. Many thanks to past, present, and future volunteers for helping to keep us warm through the long cold season! 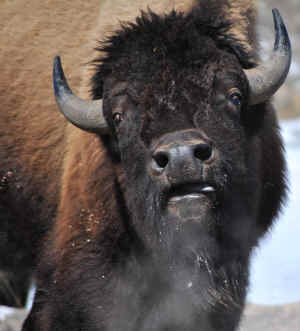 WINTER: Buffalo, led by the bulls, migrate to winter range in lower elevations surrounding Yellowstone National Park. Winter in Yellowstone can be harsh but is always extremely rewarding, and it’s a great time to get oriented with our daily patrols. Winter field patrols run sunup to sundown, November through February. SPRING: Female buffalo journey together to their traditional Spring calving grounds during this budding time of year. Hundreds of buffalo leave the park to follow in their ancestors' footsteps, gracing the Madison River on their way to the Horse Butte Peninsula. Unfortunately, Spring’s birthing migration is marred by the DOL’s repeated hazing of pregnant and birthing buffalo. Sometimes newborn buffalo calves die as a result of being hazed by the DOL. Spring is a demanding time for the buffalo and BFC volunteers. The days are long, buffalo are everywhere in need of help and witnesses. Volunteers are *badly* needed at this time of year - please make every effort to join us if you can - and bring your friends! Spring patrols run from March to early June. SUMMER: Buffalo begin migrating back to their summer ranges within the Park’s interior. While the buffalo are relatively safe inside the Park, BFC begins its extensive outreach and education campaign. BFC has limited opportunities for Summer volunteers who spend time in Yellowstone National Park and Jackson, Wyoming, to help educate park visitors about what happens to the buffalo during the Winter and Spring months. We continue to host groups and supporters visiting the area, and also organize road shows across the country, so we can take the buffalo’s message directly to the people.